Published by the U.S. Patent and Trademark Office, each of Apple's patents (1, 2, 3) are titled "Earbuds with biometric sensing" and contain common language describing a wireless earbud device configured with at least one biometric sensor. Illustrations accompanying patent text point to a device akin to a large hearing aid, somewhat similar to products currently manufactured by third party vendors. That said, the drawings are merely illustrative, meaning the disclosed technology might be applied to any number of aesthetic designs. All three inventions detail a device much like AirPods, complete with beamforming microphone array, battery, and proximity and orientation sensors. Indeed, the patents are nearly identical, with Apple using the same verbiage for background, summary and detailed description sections. The claims, however, vary from patent to patent, each outlining a specific biometric function that might make its way into a future AirPods-style device. For example, some embodiments integrate a photoplethysmogram (PPG) sensor — technology already deployed in Apple Watch — at one end of an earbud. PPGs are commonly used to monitor a user's heart rate by shining a light onto abutting skin and measuring variations in reflectivity, which can then be used to characterize blood flow. Though conventional earbud design does not lend itself to PPG measurements, Apple proposes positioning the sensor toward the speaker opening to make contact with with the tragus of the ear. A fleshy prominence located in front of the ear canal, the tragus is an ideal location for blood measurements. Like Apple Watch, an earbud-based PPG sensor would be comprised of two light emitters configured to output light at different frequencies, and two light detectors. To ensure a solid seal, Apple suggests a pliable retaining member be positioned on the opposite end of the PPG sensor to engage the concha of the ear, or the depression opposite the ear canal. Claims in a second document mention the incorporation of a VO2 sensor, GSR (galvanic skin response) sensor, an electrocardiogram (EKG) sensor, an impedance cardiography (ICG) sensor and a temperature sensor. VO2 sensors measure blood oxygen levels, while EKG and ICG sensors detect electrical activity of the heart. GCR sensors are often comprised of electrodes used to measure stress levels. Apple notes embedded thermometers can take measurements from both the user and ambient air. The various sensors would work in concert with one another to perform any number of tasks. 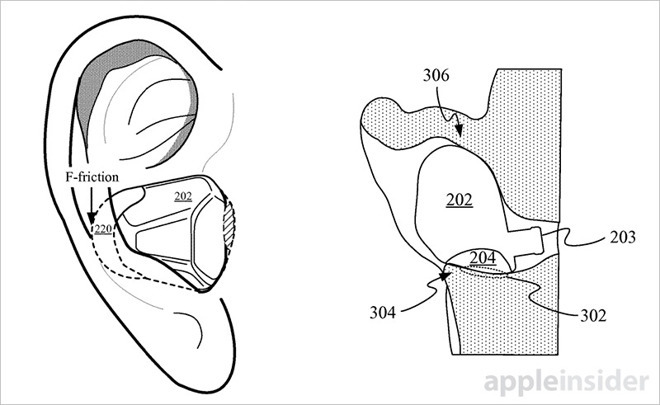 For example, orientation and proximity sensors might be tapped to determine which ear an earbud is currently located (Apple's patents call for a symmetric housing so the device is interchangeable in either ear). Those same sensors might also be used to fine tune PPG sensor input. 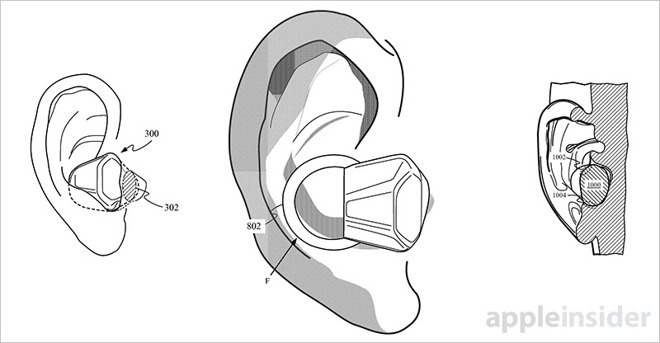 The third of Apple's biometric earbud patents details a beamforming microphone array and supporting circuitry. With AirPods, Apple uses a voice accelerometer to trigger a dual-microphone beamforming system that helps reduce background noise when the device is in transmit mode. Today's IP details similar technology, but utilizes three microphones arranged in a triangular configuration. Whether Apple intends to integrate advanced biometric sensors into its AirPods product remains unknown, but the device line already comes with a bevy of complex circuitry. In addition to the aforementioned microphone array, AirPods pack in accelerometers for tap controls and infrared proximity sensors for user detection. AirPods were introduced to buyers in December as Apple's first wireless headphone product. The device, which quickly sold out and remains in limited supply, is expected to undergo a revamp at some point in the future, though an exact refresh timeline is unknown. Technically, AirPods represent Apple's second wearable platform, but the device might not benefit from the same development cycle as major products like iPhone and iPad. Currently, the headphones are marketed as an accessory to iPhone, and as such don't rate their own category on Apple's website. Considering contemporary market shifts toward wearable products, Apple could one day soon put emphasis on building out its wireless headphone line. For now, however, it appears the company is content with a less aggressive refresh cycle, perhaps akin to the prolonged two to three year pattern seen with Apple TV. Interestingly, Apple TV was also considered an accessory when it first launched, initially advertised under the "iPod" section of Apple's website. 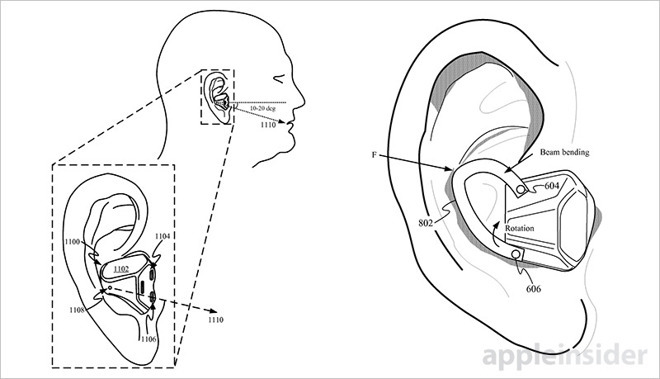 Apple's biometric earbud patents were filed for in September 2016. Phillip Qian is credited as a primary inventor on all three and is joined by Edward Siahaan and Jason J. LeBlanc joining on two of today's filings. Other inventors include Esge B. Andersen, Erik L. Wang, Christopher J. Stringer, Matthew Dean Rohrbach, Daniel Max Strongwater and Scott C. Grinker.